Women's rights advocate Kate Michelman and John Edwards's daughter Cate discussed women's rights, voting and healthcare, among other issues. The women's visit was part of a continuing initiative by Dartmouth Students for John Edwards 2008 to create a strong Edwards support base on campus. The initiative began with an appearance by Elizabeth Edwards in October. Michelman, the former president of NARAL Pro-Choice America and a well-known women's rights advocate, has been named one of Washingtonian magazine's 100 most influential women on Capitol Hill and one of Vanity Fair's 200 most important American women legends. Cate Edwards is a graduate of Princeton University and a current Harvard Law School student. Michelman opened the discussion by sharing her reasons for endorsing John Edwards over other candidates, specifically Hillary Clinton. "A lot of people were surprised that given the historic nature of the first serious woman running for president, that I [did not] automatically jump aboard ... . While it is exciting to have Hillary running, and she is a very strong candidate, that is to be recognized. I think what's most important is that we change history, not that we just make history ... and that we vote for the person who will do the right thing and the good thing." Michelman emphasized that Edwards is the candidate who will best address issues that are important to women, including ending the war in Iraq and providing universal healthcare. Gearing her portion of the discussion toward the young audience, mostly comprised of sorority women, Edwards began by stressing the importance of voting among women aged 18-24, an age bracket she called "the missing vote." She also highlighted her father's daring platform as setting him apart from other candidates. "The thing that I think that my dad brings to the table that no other candidate does in a meaningful way is big, bold changes," she said, referring specifically to her father's proposed energy and universal healthcare plans. The audience was responsible for shaping the discussion, raising many issues ranging from gay rights to public education, reproductive choice, the war in Iraq and environmental legislation. John Edwards' platform of equality pervaded many of Michelman's and Edward's responses. Although the women addressed numerous issues in depth, Cate Edwards acknowledged that it is difficult to fully represent her father in his absence. 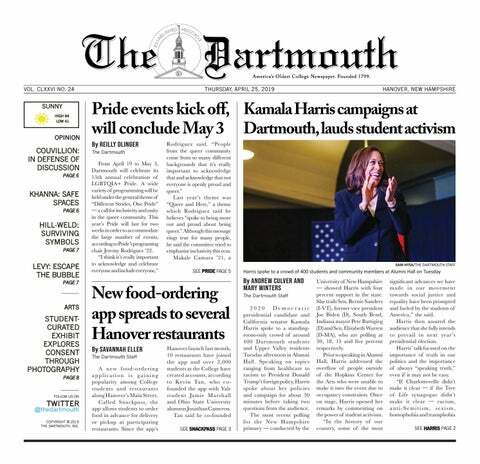 "It's sort of hard not being the candidate to get all of his policies and ideas across in an effective way," she told The Dartmouth. "I like to come out and speak with young people, especially students here in New Hampshire, because there's an incredible opportunity to really shape the future of the country, the future of the Democratic Party with votes here. I would encourage all students at Dartmouth to get involved and to learn as much as they can about the candidates." Katherine Hilton '09 said the talk was effective in strengthening their support for Edwards. "I came into this event an Edwards supporter," Hilton said. "I've been an Edwards supporter for a while. There were some issues I was a little unsure of because I am a very strong feminist and a very strong supporter of GLBT rights. I knew he was the right candidate for a lot of domestic issues but the talk really reassured me that he definitely can be the right candidate for international issues. The underlying principle of representing the marginalized and giving a voice to people who don't have a voice is something that I feel very strongly about." Others simply appreciated the opportunity to have an informal discussion with political figures. "I really enjoyed the event because I liked the intimate feel that it had," Jordan Osserman '11 said. "I thought it was different from the other campaign events that have come to campus recently in the way that it was very relaxed and informal. Both of the people representing Edwards were willing to talk in depth and bring personal experience into their conversation. It gave me a positive impression of the campaign because I liked the way that we were treated." John Edwards himself will speak at 5:45 p.m. on Monday at the Top of the Hop.